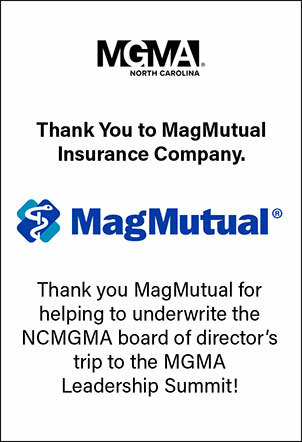 The North Carolina Medical Group Management Association (NCMGMA) would like to take a moment to thank the companies who generously supported our organization in 2018 and helped us to have another successful year: our Alliance Sponsors! Interested in Seeing Your Name on this List for 2019? Registration is open for you to join the list of organizations who proudly support NCMGMA. For complete online information regarding benefits and costs, please follow this link. Make plans to meet our 2019 Alliance sponsors at our upcoming Annual Conference, May 8-10, 2019 in Wilmington, NC. Watch for more details on this event coming soon.